Discussion in 'Team OcUK Distributed Computing Projects' started by Area 51, Aug 3, 2010. Pretty chuffed, I've managed to climb up the MilkyWay leaderboard with me 58xx combo. Currently 8th/9th place in the OCUK team on RAC. (Currently 40K). May all come to a grinding halt when the leccy bill comes though! Team Norway next on the horizon for stompage! Congratulations....trying to comprehend it, you must have driven yourself batty trying to get all that tubing in there. Are there five loops & five pumps? I must admit - it was extremely difficult to fit everything inside the 800D. And the temps are a lot better than expected. CPU & MB cooled by a 3x120mm RAD (stand alone pump and single bay res) and each GPU cooled by a 120mm RAD (fed by two dual bay res with two pumps moounted underneath on each). Can you do a shot of the inside of the drive cage where the tubing exits the pumps? And I thought mine was bad! 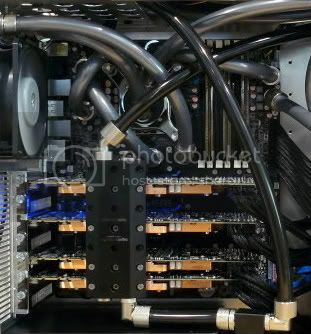 Watercooling is not as bad as you might first think. Just take a look in the watercooling section and it'll give you a good indication of layouts and what is and is not needed. I never touched wc until the last 6 months or so and would not go back now, true the outlay can be a pain but you wil reap the benefits by being able to overclock further than you would on air. Im new to this, with those specs, what do you think i should be doing? What is that program a few posts above? How can i set BOINC to use 50% cpu usage instead of 100%? Log into your account at BOINC and set the cpu usage. It's fairly obvious once you're there. You can also do something with a file called cc_config.xml which should be in you BOINC/DATA directory. Google for cc_config.xml; it's basically a way of setting local preferences.